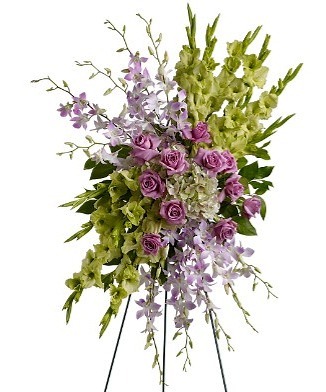 Opulent blooms: Glads, Roses, Dendrobium Orchids and Hydrangea in soft shades of green, lavender and plum are grouped together for maximum impact in a memorable floral spray truly reflective of your Love. Available year round. To insure availability order should be placed two days prior to delivery or call 1 800 875-9193.